Kathy has been a full-time Real Estate Agent since 1979 and Gloria since 1989 representing clients in Long Beach, Lakewood, Seal Beach, Huntington Beach, Westminster and other areas of South Los Angeles and North Orange County. For the past 20 years they have specialized in the Leisure World Seal Beach Community. 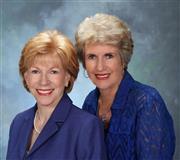 Kathy and Gloria feel fortunate to work as a team serving the real estate needs of their clients. Together they have listed and sold over 3,000 properties. They are solution oriented and say about real estate. “It is a great profession. It is about buying and selling property, but more importantly about people; their desires, wants and needs. Real Estate is a service in which professionalism, knowledge and integrity are necessary standards. They feel that one of the most important things a Realtor can do is to listen to their clients in order to help them achieve their Real Estate goals. Clients become like family and friends, they appreciate their clients loyalty and commitment and look forward to serving their clients Real Estate needs and those of their families for years to come. Kathy and Gloria are 5th generation Californians and natives of Long Beach. They have been involved in ownership in Leisure World since 1988. They enjoy the many activities Leisure World has to offer and they agree that there is something there for everyone. This belief and enjoyment in Leisure World makes it a pleasure to list and sell property in the community. Kathy’s husband Walt is a retired Fire Captain having served on the Long Beach Fire Department for 25 years. They have two terrific sons, two lovely daughter’s-in-law and four beautiful granddaughters. Gloria is a proud mother of three sons, two very special daughter’s-in-laws and an adorable grandson. Both Kathy and Gloria are very involved in their church families and community. Kathy and Gloria are happy to be affiliated with Prudential California Realty and are excited about the many opportunities and marketing tools Prudential offers to better serve their client’s. Good strong cooperate support is invaluable. They look forward to assisting you in achieving your “Real Estate Goals.” Give Kathy or Gloria a call if you have questions about the Leisure World Seal Beach Community, other properties or market conditions.